A 45 Year Old Ben Nevis 1972 Single Malt, with a design inspired by the Scottish legend of the Cù-Sìth, has earned a Gold Award for taste in the 30 - 45 year old category at the 2018 International Wine & Spirit Competition. Taking away the prestigious industry award in the Highland Single Malt 30 – 45 Year Old category, this 45 Year Old Ben Nevis 1972 Single Malt (70cl; 43.2% ABV; £650 RRP) was aged in a sherry hogshead. A highly limited release, of which only 228 bottles are available, this is the first in Cask 88’s series of single cask whisky bottlings inspired by legends of Scottish folklore.This venerable Ben Nevis whisky is typified by the Cù-Sìth, a terrifying large hound, with a murderous bark, said to stalk the Highlands of Scotland. The Cask 88 Scottish Folklore series is intended to bond the stories of Scotland’s unique history with the very finest expressions of its spirit; the beastly Cù-Sìth was deemed the perfect match for the equally indomitable spirit of the Ben Nevis Highland whisky. Legend tells that anyone with the misfortune of hearing the beast bark three times will be transported to the underworld. The Cask 88 Scottish Folklore Series will consist of six unique, single cask expressions, with each expression dictating the myth or legend it embodies. 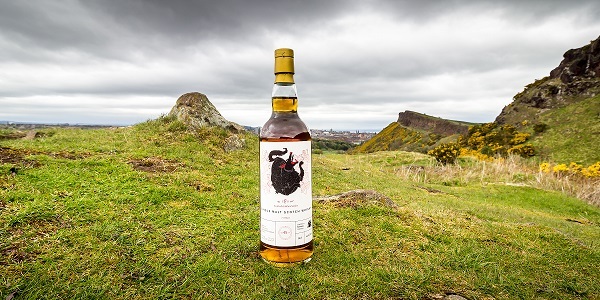 Each release in the Cask 88 Folklore series will feature a mythical beast who has roamed the highlands, stalked the lowlands or inhabited the islands. Cask 88 have worked closely with art historian and Celtic Revival specialist Dr. Frances Fowle (co-curator of the Celts: Art and Identity exhibition, British Museum, 2015-16) to understand the history of the Cù-Sìth legend and its place in Scottish folklore. The first bottling in The Cask 88 Scottish Folklore Series: Cù-Sìth is available for purchase from the Cask 88 online bottle shop and in person from Cask 88 Sales Representatives globally. European Sales Director Jonny Fowle is available for interview. Please RSVP to arrange, Miriam Rune: miriam@cask88.com / 07740 339 628.